In this post we interview Kat Jefferies our Principal Consultant for Building Services. Here she shares insights into her role and what it’s like working at Energi People. Our Principal Consultant for Building Services, Kat Jefferies, is one of the long standing members of the Energi People team. She joined in 2013 as a Building Services Recruitment Consultant and having consistently put the hard work in, has steadily made her way up the ranks. 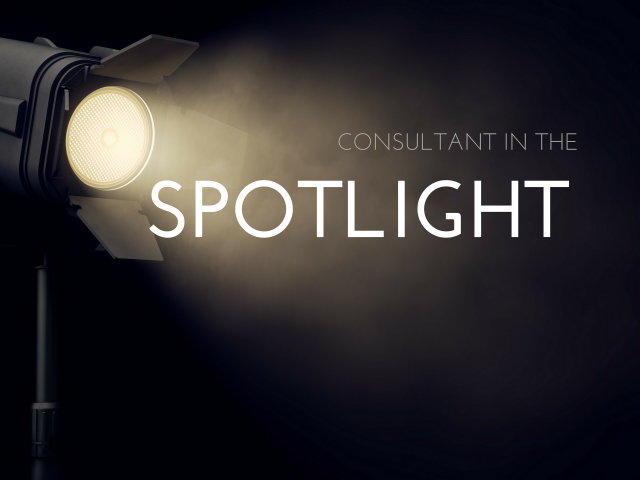 In this ‘consultant in the spotlight’ blog post I spoke to Kat about her role and what it’s like working at Energi People. Read on for her insights and if you want to speak to Kat about building services jobs, give her a call! Kat Jefferies: I will have been at Energi People for five years in September. I started as a Recruitment Consultant and have worked my way up to Principal Recruitment Consultant, with two promotions from Senior to Principal. When I entered Energi I think I was fourth or fifth in! I work on the commercial side so I recruit M&E Quantity Surveyors, Commercial Managers and M&E Estimators and I’m part of the Building Services team. KJ: Before joining Energi People I worked for another recruitment agency where I gained roughly a years worth of experience. I was then approached by Energi People to come and join them. Prior to my recruitment experience I’d been in a number of sales roles, B2B, and cold calling; but originally I’m a qualified hairdresser! KJ: I think the best thing about working for Energi People is the culture and the working environment. Everyone’s very approachable. The Directors are active directors they don’t sit in their own little offices; they’re approachable and are on the floor with the consultants. I think it’s the environment that makes it most enjoyable. KJ: I’ve learned a lot about the construction building services sector, I’ve learned a lot about my niche market which makes it easier for me to recruit for my clients. I’ve also learned a lot about myself as a person – I started off as a young 20 something year old, now I’m approaching 30! I’ve progressed in my career by achieving two promotions in the five years I’ve been with Energi. KJ: I think the key challenge my clients face finding good candidates is that we’ve got a skills shortage within the market. So it’s really important to have an experienced recruitment consultant who can drill down, knows the market, knows the right questions to ask the candidates to get the right level across so they’re not wasting time interviewing people that aren’t right for their business. It’s important to build a relationship with recruiters so that time is shortened and you get the right level of staff. KJ: “I think the biggest challenge candidates are facing in the market is that they’re trying to ask for too much money for the level they’re at. It’s really important that they place themselves at the right market rate to secure the best jobs, with the best progression, so they can achieve the salary they want further down the line – instead of asking for it straight off. Candidates are getting turned down for good roles because they’re asking for too much. Do your market research! KJ: Recruitment has changed a lot for me personally since I started five years ago having had a baby; working while pregnant, going on maternity leave and coming back part time. So my recruitment approach has changed since I started, I’ve had to adapt to a new way of working in a shorter timeframe. Also LinkedIn wasn’t a big thing when I started but now it’s massive, so recruitment consultants need to be able to adapt to new technologies and ways of approaching candidates, and ways clients want to work. It’s about being able to adapt to the new technologies and the times. The market fluctuates, sometimes you’ve got loads of roles and no candidates, then the market crashes and you have loads of candidates and no roles; so being able to adapt to the current climate is key. You need to be able to deal with the highs and lows, getting commission and not getting commission. My recommendation for anyone coming into recruitment is to really do your homework on the companies you’re interested in working for. Get into a market that you’re going to enjoy, whether that’s high speed tech work, high street, head hunting or becoming a specialist in a market. Make sure you enjoy it, take ownership of it. KJ: You get rewarded for your hard work and those rewards are not down to your boss paying them, it’s down to how much hard work you put in. If you want to work hard, you’ll get rewarded for that. It’s not just commission; at Energi People we’re incentivised with trips and bonuses as well. If you’re in the right company, and working in the right team, you’ll have good people around you that you can bounce off, will help you progress and learn, and you’ll enjoy working with. KJ: To carry on with what I’m doing at Energi and progress up the career ladder as much as I possibly can. I want to help grow Energi as a team and company, and get the Energi brand further into the market. Personally I want to do well in my job so that I can have a good life and a good life for my little boy, give him a stable upbringing and maybe have another baby at some point. I’m also looking forward to doing the London to Brighton bike ride with the team! KJ: I don’t really drink tea, but if you want to make me a coffee I take it white, no sugar. JK: Are you a dunker? KJ: I used to be a dunker until I got on the scales, so now I don’t dunk. But if pushed, make it a custard cream. KJ: There are a few. Winning a trip to Barcelona to watch the F1 live, that was a big highlight. Being promoted twice. Having understanding management who let me work four days a week when I had my little one. Hitting my yearly target two years in a row. KJ: Connor! He’s fairly new to the team, has been with us a few months. He’s a trainee consultant and is always happy, wants to listen and learn, he’s a team player and I can see him being a superstar over the next year. I hope you found this little insight into Kat’s working life interesting. If you are looking for a role as an M&E Quantity Surveyor, Commercial Manager or M&E Estimator, she’s the person to speak to! You can also find details of our current openings on the Energi People Hunted page here.